Main Street and Acosta bridges offer a training ground for runners who want some altitude. The closest thing to hill training in Jacksonville is a mean quarter-mile, 6% grade over the Acosta Bridge. This 1.7 mi loop goes over the Main St. bridge and comes back across the Acosta bridge, using The Landing as the start and end point. The Acosta Bridge is a 6-lane bridge, with two pedestrian walkways, and is also notable because of the blue neon lights that illuminate it at night. This loop features magnificent views of Downtown from the crest of the bridge. The bridge connectors are Mary Street (south bank) and Water Street (north bank). Add-Ons: Lovely running in the San Marco area on the south side. RiverWalk running on north side. 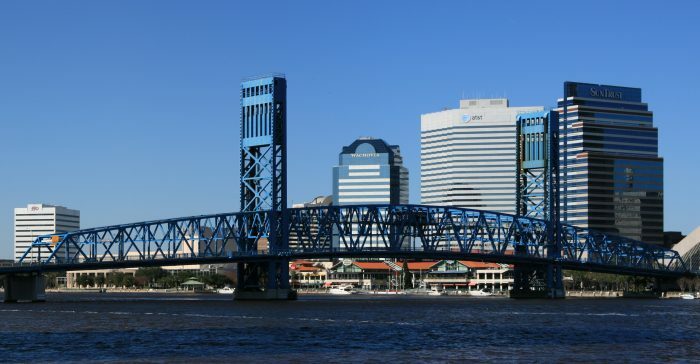 Another option is the enjoy the Gate River Run course, one of the more popular races in Jacksonville. Note: The Hart Bridge is not accessible to pedestrians. But, you can modify and use the rest of the course as an out and back.